Objective: To gain a broader understanding of Chicana/o Art, with a focus on Chicanas and the Virgen of Guadalupe. Requirements: Respect for Chicana/o art production that reflects the evolution and expansion of Chicana/o identity. Commitment to tolerance and an openness to learning about a different point of view. Many of us have academic/institutional degrees like MFAs, but we know the experience that lead to that document does not necessarily reflect what we know about Chicana/o art. Academic education is incomplete unless supplemented by self exploration, community involvement and experience contributing to a lifetime of learning.
)" Page 238, Chicano Art: Resistance and Affirmation, 1965-1985. They expressed their resistance to the male-dominated structures of Chicano nationalism and to the larger social and class structures that affect women and children even more than men. Their visual and conceptual trasnformation for the female image from victim to role model and heroine was an important step in this stage of Chicano liberation." Page 322, Chicano Art: Resistance and Affirmation, 1965-1985. Dear Alma, thank you for your posting Feb 2, 2002: "The Education of Pedro Romero Sedeno". 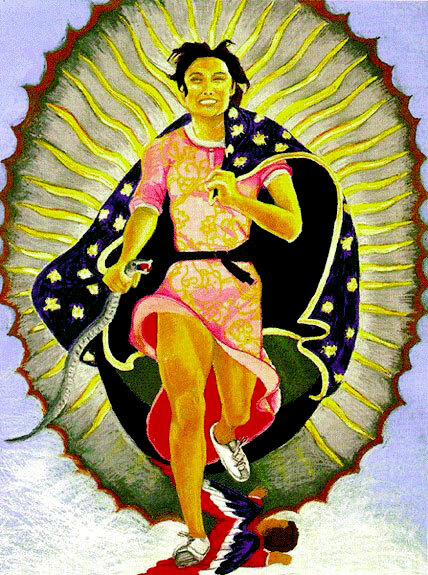 In pursuit of your objective: "To gain a broader understanding of Chicana/o Art", with a focus on Chicanas and the Virgen de Guadalupe", please know that I am preparing a response for this discourse which you have initiated. Please give me a little time (actually, I've got to clean my house right now) In the meantime, can you please provide me the name of the author you cited from the CARA catalogue you cited from? I was curious. Also, for purposes of this discourse, I would like to make two distinctions as to the visual interpretations Chicana artists have made of the Virgen de Guadalupe original Image. One interpretation put forth by many depicts the Image intact, in which the prominent forms in the icon are all included, i.e. pose, aureole, garments, crescent moon, etc. Works by Santa Barazza, Delilah Montoya, plus a long tradition of depictions with the Image in which the diverse formal investigations of the Image express a fidelity to the content of the icon. This type I believe is considered as interpretation. The second type of interpretation (actually a modification or "re-image" as you call-it), is that offered which does not pursue this fidelity to the Image-content, and instead is selective in its choice of elements in the icon, deleting some and adding additional content derived from the artist's personal experience. To this second type of interpretation, your Lupe series, and the portrait of the Virgen by Yolanda Lopez, subscribe. Please correct me if I am wrong, Yreina Cervantes is the artist who produced "the Virgen in High Heels", an image I see as falling into this category as well. A few male artists have made this type of interpretation as well, but our objective here is to dicuss the Chicana expression, right? Is it fair to call them modifications as opposed to interpretations?. > In the meantime, can you please provide me the name of the author you cited from the CARA catalogue you cited from? I was curious. This quote was from pages 238 and 322 of the CARA Exhibition catalogue (paperback), no specific author for this section is cited. So I would probably say that the author might be the CARA National Advisory Committee. Perhaps someone involved in the organizing of this exhibition can answer that for us. > Also, for purposes of this discourse, I would like to make two distinctions as to the visual interpretations Chicana artists have made of the Virgen de Guadalupe original Image. One interpretation put forth by many depicts the Image intact, in which the prominent forms in the icon are all included, i.e. pose, aureole, garments, crescent moon, etc. Works by Santa Barazza, Delilah Montoya, plus a long tradition of depictions with the Image in which the diverse formal investigations of the Image express a fidelity to the content of the icon. This type I believe is considered as interpretation. > The second type of interpretation (actually a modification or "re-image" as you call-it), is that offered which does not pursue this fidelity to the Image-content, and instead is selective in its choice of elements in the icon, deleting some and adding additional content derived from the artist's personal experience. To this second type of interpretation, your Lupe series, and the portrait of the Virgen by Yolanda Lopez, subscribe. Please correct me if I am wrong, Yreina Cervantes is the artist who produced "the Virgen in High Heels", an image I see as falling into this category as well. A few male artists have made this type of interpretation as well, but our objective here is to dicuss the Chicana expression, right? Is it fair to call them modifications as opposed to interpretations?. > Alma, I hope you will be able to give some attention to my future response, and to continue in this important discourse on Chicana art. I sometimes do the extra effort of opening microsoft word in order to copy and past the enye. With regard to your forthcoming debate with Alma Lopez, I think it would be a courtesy to all others if the participants adopt everyday English to the exclusion of in-group shop talk and technical language.To express life-long curiosity that I have had, I would like to prompt the discussion with a question. What is Art? And what is an artist? What is the sphere that constitutes an artists domain? If I had an answer to these questions I would be better able to follow and understand the exchange. Thanks. Kindly do not entertain the notion that I am being facetious. I'm not. Nor do I desire a series of platitudes and truisms as a reply. I would wish that both of you would participate in this response.